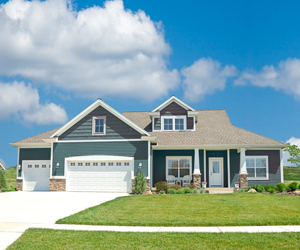 Siding plays a major role in your home's overall exterior appearance. A beautiful siding that compliments your home's structure will make your home look beautiful and vice versa. If you want a home with excellent curb appeal then you need to have beautiful and durable siding installed. Here at Green Built Roofing you can count on us to always provide durable and beautiful siding regardless of the type of material you choose. If you want beautiful, quality siding installed then look no further than your local experts at Green Built Roofing. We offer a variety of quality siding products and materials from leading manufacturers and our expert team can help you select the type of siding that will work best for you. We can also help you select shingles and accent and trim colors to create a unique, unified look. Click below to schedule your free estimate! We installed all new vinyl energy efficient windows and siding for this home along with a new metal roof. These customers had watched us do the same to another home near them in the same city and they were so impressed that they called us to flip their home exterior. You can see we did just that in these before and after photos. If you want to see more of this job then check out our pictures in the photo gallery! A customer came to us looking to work on a number of projects. This one included a major siding remodel. They had older white siding on to begin with and decided to change it up. The new siding really makes this house pop! We took off old light colored aluminum siding and installed a darker shade of new premium vinyl siding. This color choice gave this house instant curb appeal and gave it a new modern look!! Choose the right material. There are a lot of different siding materials available on the market. Our siding experts can examine your home and determine the type of siding that would be best for your home. There are a variety of different siding materials available on the market that offer different benefits. For the inexperienced, it can be overwhelming to try to decide. Green Built Roofing's expert team can help you decide just what type of siding type would be best for your home and budget. No matter what material you're interested in you can count on us only providing you with options from trusted, leading manufacturers. Schedule your free siding estimate! Every siding option is beautiful, durable, and lets you customize your home's exterior appearance. Once you've taken a look at our many options you can contact us online or give us a call to schedule a free estimate! We install your new siding at a time that's convenient for you and help you decide the type of siding that will work best for your home. Green Built Roofing provides our professional siding services in Holland, Dorr, Wyoming, Wayland, Grand Rapids, Byron Center, Middleville, Hudsonville, Allegan, Caledonia and surrounding areas.